Like an E.R. Doctor zapping the guy with eight bullet holes in his chest with shock paddles to no avail, I think it's time to call it. What are we calling? We are calling the low budget shark attack flick. We're calling it. We here at the FCU are arbitrarily making the global decision that the low budget shark attack movie has run its course and shall be no more. 'Shark Week' makes the fourteenth, yes fourteenth Shark Attack movie on this site, with none of these Shark Attack movies being Jaws or Deep Blue Sea or nothing. All low budget. Except for maybe 'Bait'. And possibly 'Shark Night 3D'. Which was awful. What has brought me to this decision? Why The Asylums 'Shark Week' has, all by itself, is what has brought me to this decision. Eight people are kidnapped from wherever they were at the time and brought, in shackles, to the remote island lair of the super evil drug lord Tiberon (Patrick Bergin). Apparently the word 'Tiburon', spelled correctly, means 'Shark' in Spanish and here I was this thinking dude named himself after that sporty Hyundai coupe. Tiberon, and his equally evil moll Elena (Yancy Butler), have a plan for these eight people… make that seven… who Tiberon has deemed that they have done him some wrong. Who are these people? We don't really care because there are way too many of them, but their task is a simple one. Survive the sharks.  Tiberon has dispatched these people on his island and they have tasks to perform. The tasks are lame. They basically consist of going into shallow pools of water and getting eaten by sharks. See what I mean by lame? They could run, but then Tiberon would dispatch his army of evil mercenaries to kill them all on sight. Even though all we saw was the old crazy guy and his aging hot girlfriend, but since they told me there were armed troops on the island, I will believe that there are armed troops on the island. Thus our heroes carry out these tasks, which as we explained consists of walking around the beach and then going into shallow pools of water to get eaten by crappy CGI sharks when Tiberon orders them to do so. And they systematically die when they do this. Because Tiberon has promised them a boat if they succeed, and they believe him. Tiberon also watches all this action on his remote cameras, which move as if there was a cameraman controlling them with zooms and pans and dolly shots and all kinds of stuff. Tiberon has the most awesome remote camera setup ever. He also watches this stuff while tucked inside his island mansion. At least that's what we're looking at from a distance. Inside the joint it looks a rundown studio apartment, but then having never been inside an island mansion, how would I know what the inside of one looks like? Invariably the sharks kill most of these idiots and I think Tiberon has won. The only way he can't win if for some ungodly reason he and his moll exit the safety of the mansion and start walking around the beach giving the one survivor an opportunity to kill them. But that couldn't happen because that would be dumb. Besides, if this alleged one survivor did this I'm sure Tiberon's mercenary troops would kill this person on sight. Right? Well my friends… Director Christopher Ray's 'Shark Week' is pretty terrible. 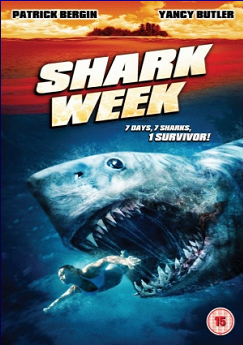 Now usually I qualify a blanket statement such as that one with something like 'It was terrible but we knew that going in and thus…' but sadly there will be no qualifications coming from me for 'Shark Week' which is why I'm kind of forced to Call It on the genre. The litany of cinematic crimes that 'Shark Week' has thrust upon humanity is lengthy, and we will be mercifully brief while speaking of the ones we have time to mention. For starters, it's dull. Dreadfully so. None of the victims really distinguished themselves from one another, that includes the men from the women, and as such they all made for one big clump of bland characterness. Except for maybe Frankie Cullen, playing a character aptly named Frankie because I guess Mr. Cullen wasn't responding when they called him anything else. He seemed to be channeling the ghost of David Arquette with his performance. That is if David Arquette was dead, which I don't think he is. This movie also completely suppressed the YBE (Yancy Butler Effect) as even Yancy chewing scenery couldn't bring much life to the proceedings. And hell if I know what angle Patrick Bergin was taking with his performance. Somebody needs to ask him this in a future interview, if he even acknowledges he was in this movie. We saw you Patrick. Don't deny this. I heard an interview with Academy Award Winner F. Murray Abraham and all he did was talk about 'Amadeus' and his stage work. Not once did he mention 'Blood Monkey'. What's up with that F. Murray? Ah, but what really makes 'Shark Week' kind of an unforgivable blight on the Shark Movie genre is that the CGI sharks looked awful. I thought, since there were so many low bud CGI shark flicks, that CGI sharks were easy, but I would be mistaken. We didn't even get the one prosthetic shark head held by some guy off camera to work with. Our actors just splashed in water to simulate shark attacks, when it really just looked like they were just splashing in water. And the sharks growled. For starters, I don't think sharks growl, and if they did, would you even be able to hear them underwater? I don't think so. 'Shark Week' was awful and I'm Calling It! It's over. Just as soon as I finish watching 'Shark Swarm', 'Jurassic Shark', 'Hammer Head', 'Shark in Venice' and 'Spring Break Shark Attack'. And then it's Over! And 'Shark Zone'. And Shark Attack 1thru 3.